Are you tired of being the underdog? Are you ready to see your rating increase?! If so, read on! The question is always the same: how to win chess games against a good player? To beat a stronger player, you need to be ready to induce and exploit mistakes, but how to do that? This video series focuses on concepts, ideas, and patterns that are essential to know to spot those opportunities. This video series focuses on concepts, ideas, and patterns that are essential to know to spot those opportunities. Even the best players in the world lose games, and this series solely relies on more than 200 sample positions and games that feature a world champion on the losing side vs. a non-world champion, sometimes even against a clear underdog. Included: Video series comes with PGN of all games and positions! Even the best players in the world lose games, and this series solely relies on more than 200 sample positions and games that feature a world champion on the losing side vs. a non-world champion, sometimes even against a clear underdog. If even World Champions are taken down with the help of the presented subjects, why not your next opponent in a local club event, or in your next tournament? The more ideas and patterns you know, the easier it will be to find a good solution in your games. Watching this series will help you to better spot your opponent's mistakes and exploit them more effectively. 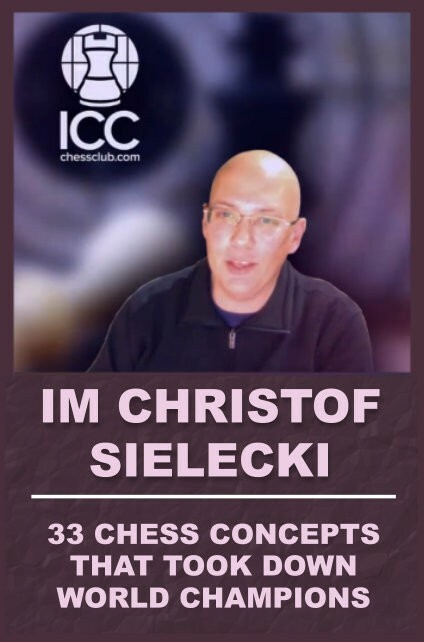 The 33 Chess Concepts series is divided into 33 training videos, covering more than 19 hours of top-level instruction, by one of the best and most illustrative teachers on ICC today! Very soft, easy to read/see!